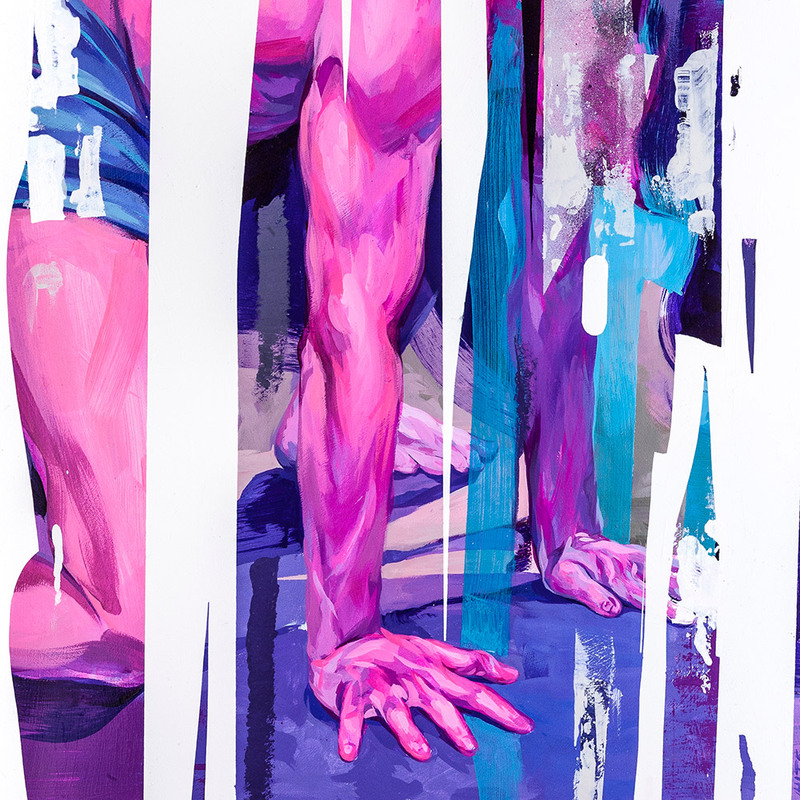 Taylor White is a figurative artist who combines refined techniques of classical training with bright, unexpected color choices inspired by street art and pop culture. She was raised in Raleigh, NC and educated at the Savannah College of Art and Design, completing her Bachelor of Fine Arts in Illustration in 2007. White has exhibited internationally from Melbourne to Berlin, LA, Miami, Atlanta and Detroit. She has contributed to events for Just Another Agency, Analogue/Digital, Juddy Roller, Outer Space Project, Richmond Mural Project, Murals in the Market, and SCOPE Miami Beach. She is currently based in Raleigh, NC and Atlanta, GA. The human form is an exquisitely expressive conduit through which we may depict conversations, explore fields of consciousness, and realize the cathartic points at which the soul confronts its physical form. I am endlessly inspired by the movement of the body, particularly as it represents itself through improvisational dance. I consider the dance floor a fantastic microcosm in which one can observe a very deep aspect of human connection; one that explores trust, boundaries, and relationships, and the graceful instinct of the human body to move through space. My work builds upon the universally recognizable visual language of movement. I draw much of my source material from the dance community in Raleigh and Durham, NC; after I spend time studying and participating in the movements of freeform and contact improvisation, I work to capture unexpected, emotive expressions by which the human forms coalesce to create an abstraction of themselves. The work is a practice of layering shape and color by way of individual, drawn strokes and swaths of acrylic and aerosol, which mimic a certain controlled chaos. The work builds slowly, creating spontaneous dialogues, necessitating an alertness and a certain trust in my own intuitive instincts. The process becomes a dance in and of itself, as I discover new points of focus amongst the coalescence of shapes and movements that I've depicted. Physical Phenomena continues the conversation surrounding the fundamental elements that constitute the structure of being. Our bodies are interpretive structures designed to grapple with formless potential, and, through our capacity for action, to bring forth habitable order. This work explores the way in which we experience the formless chaos of potential through being, and how the order we inhabit can sometimes dissolve backwards into the incredible complexity from which it emerged.